Your horse will enjoy a roomy pasture with good grazing - no more than 10 horses in one pasture. All pastures have a run-in shed in which hay is provided free choice in winter. Grain and a "look over" are provided daily. Each horse has his own box stall. Management catches up horses in stalls only in wet, cold weather. Owners are responsible for cleaning stalls, or can contract with assistant. $250 per month included daily feed and bad weather catch up. At Spring Ridge Farm, we provide considerate care for your equine friend, and a relaxed, congenial environment with great facilities for you to enjoy. Assistance for you and your horse in all phases of pleasure riding, from green horses or new riders, onto the more experienced riders or older horses needing a touch-up, or problem solved. We occasionally have horses available on a monthly lease or for sale. Leasee pays board, blacksmith, and other care necessary - no additional cost for lease. $ 250 is monthly lease cost. Our mission is to provide a great place to live for happy healthy horses, and a relaxing, enjoyable environment for their owners. We have been keeping horses happy on our farm in the beautiful Blue Ridge foothills since 1988. 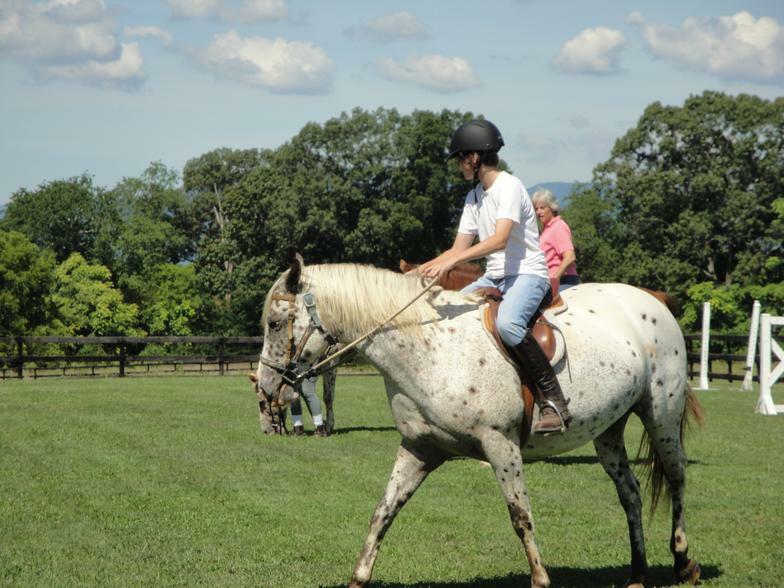 Our facilities are great for enjoying riding your horse, or just enjoying the companionship of your equine friend.